Leland Dashiell was one of the rising stars of the city police force, making detective younger than anybody before he moved into his dream division: homicide. Life on the street made his dream job into his worst nightmare. City Hall and corruption on the force gave him more trouble than the criminals he was hired to catch, and, disillusioned after an incident with the police captain he doesn't like to talk about, he took to the streets instead. This time, Leland Dashiell would catch criminals, and he'd do it on his own terms. His way. His first case, The Comfortable Legend of the Unnamed Phantom, came when a murder victim's best friend turned up in need of help. He knew the story well. The cops didn't like to take more than a few minutes with any investigation, so when things seemed funny, the victims turned to private detectives like him. The friend was desperate and, more importantly, he paid cash. Dashiell hit the streets to see what he could dig up, stopping by the crime scene first. To say it was a slaughterhouse would significantly understate the carnage. The victim put up quite a struggle, which explained how blood got on the ceiling, but the truly interesting part of the scene was a bloody footprint that didn't belong to the victim. Dashiell's police training lead him to suspect a thin man was responsible for the crime, and a threatening note at the scene was another clue. Someone wasn't pleased with the victim, but was he angry enough to kill? To murder? The client hadn't offered much at the initial interview, so Dashiell headed his way in search of more information. Two things became clear when he answered the door and took Dashiell's coat: One, he was a slim man who knew the victim well. If there's one thing the police department teaches you, it's to never trust your wife or your best friend. Two, he was left-handed. Dashiell had never been the churchgoing type, but even he knew that you could never trust the sinister nature of a southpaw. The client gave up a few names, though he seemed a bit twitchy. The wheels were already turning in Dashiell's head, especially when the client's alibi didn't check out. All that remained was a motive, which seemed like a dead end, but one Anne Do finally gave Dashiell the clue he needed. 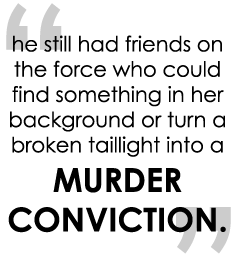 She clammed up under questioning, right up until he reminded her that he might've left the department, but he still had friends on the force who could find something in her background or turn a broken taillight into a murder conviction. Lots of murders go unsolved, and the department is always happy to close up another one. Amazingly, she remembered a loud argument the victim had the night before his untimely demise with none other than his best friend, the same one who hired a private detective when the victim turned up dead. Call it a miracle.